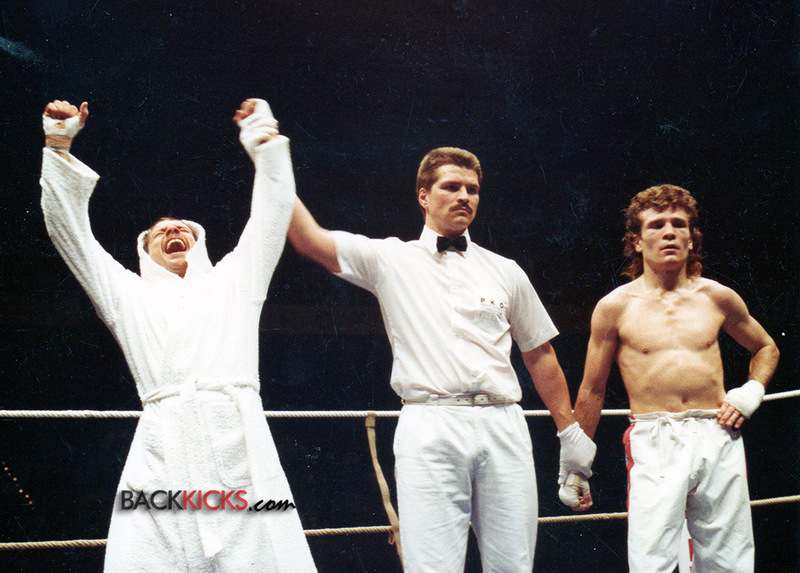 During the best days of WAKO and PKO, two fighters consistantly dominated the lighter divisions. 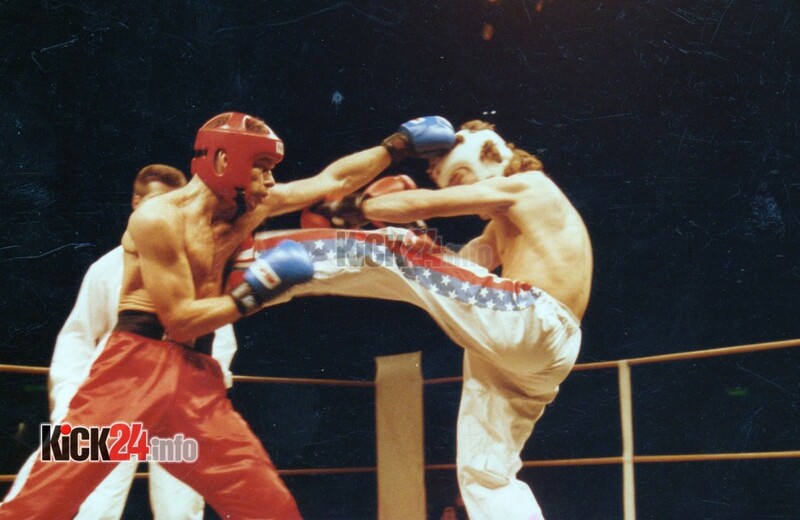 One was American Troy Dorsey who was the King of -57 Kg division from 1983 until 1990 in both, semicontact and fullcontact winning WAKO world titles in London and Munich. One division up, German Michael Kuhr of Berlin won world titles and nationals in fullcontact and light contact. Both were accomplished boxers with Kuhr winning Bundesliga matches in Germany and Dorsey fighting for professional world titles in various weight divisions. It was a dream of American promoter Michael H. Anderson to match up these two great fighters. The first match took place in March 1998 in Berlin, West Germany. It was a five round fight sanctioned by the PKO (Professional Kickboxing Organization). Berlin’s 9000 seat capacity landmark event facility “Deutschlandhalle” hosted a series of fights with the best US-American fullcontact fighters taking on the best Germany had to offer. The main event was headed by 4-time WAKO world champion Ferdinand Mack moving up to light-heavyweight challenging legendary Don “The Dragon” Wilson for the PKO world title. Kuhr and Dorsey fought a great battle with Kuhr punching and kicking in high frequency gear and Dorsey trying to score powerful, destructive shots. Berlin’s hometown hero held a tiny lead until later in the fight. Dorsey was unable to land big hands, but easily coped with hits. As foot sweeps were legal in Berlin the Texan martial artist swept Kuhr off of his feet scoring big surprises. However, at the end, Kuhr was leading by points to capture a decision victory. It is to be noted, this fight took place at Kuhr’s higher weight division and Dorsey’s corner protested the outcome. One month later Troy Dorsey was scheduled to fight for the PKO world title -57 Kg in Gothenborg against Swedish challenger Dennis Sigo, but the Swede had broken his hand during sparring just one week prior to the event. Michael Kuhr was asked to take this fight and move down in weight on short notice. The German accepted as he was fit for Bundesliga boxing matches. The German fought a brave battle for 10 rounds – it was his first time to fight such long distance as he was used to three and five rounders, only. Due to the short time frame of preparation and lower weight the German had no chance against the American. 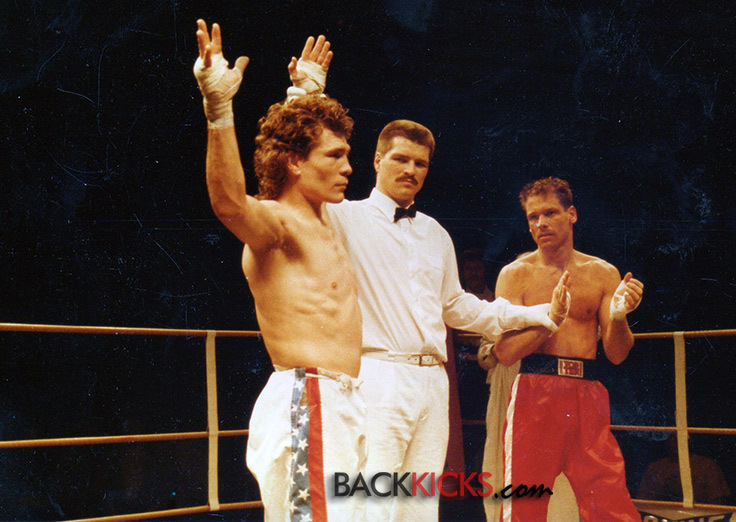 Texan Troy Dorsey dominated the bout and earned an unanimous work victory to become the PKO’s first Bantamweight world champion. Both, Dorsey and Kuhr became world famous as martial artists and stand as inspiration for new students and talents. Troy captured world titles as a professional boxer winning an IBF world title belt. He operates martial arts schools in Texas. Mike Kuhr advanced as an expert for security in his home town of Berlin where he protects celebrities working as their personal body guards.